Prof. Dr. Latha Krishnadas (resident of 4th Avenue, Ashok Nagar) was received Late Dr. A.P.J. 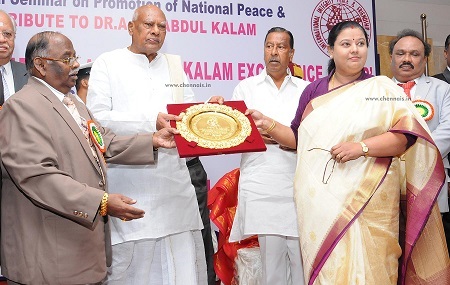 Abdul Kalam Award from World Peace and Friendship Council on Oct. 20. The award was presented by Dr. K. Rosaiah (Governor of Tamilnadu) in presence of Justice T. N. Vallinayagam, Dr. G. Manilal (President, Councill) and other eminent personalities for the excellence in the service in the field of industry and academics for the past 2 decades. Latha is the Professor & Head Research and Development Center- Rajalakshmi School of Business, Chennai and she also served in KIC -International University College -Abu Dhabi (Dubai) handling classes for Principles of Marketing, Managing Recruitment, Selection and Induction, Contemporary Issues in Strategic Management, Principles of Management, Supply Chain management, Project Risk Management, Fundamentals of Commercial Law, Management related subjects. She also received number of awards from the various organizations, presented the paper on various topics in international seminars. She has organized and conducted corporate training program for various service industries on Customer Relationship, Internal & External communication, Ethics, Conflict Management, Problem analysis & Decision making techniques, Marketing Practice in service sector. Latha has received many awards it includes “Outstanding Management Teacher Award” by MTC Global UN compact –September 2014., “Priyadarshini Indra Gandhi Award for Excellence in the field of Education in the year 2012.-IIP&FS “Rashtria Vidya Saraswati Puraskar”-2010 from International Institute of Education and Management.-New Delhi, “National Mahila Rattan Gold Medal Award” by Indian Solidarity Council-New Delhi, “Best Management Educator of the Year” from World Management Congress-New Delhi 2009 affiliated to United Nations. She traveled outside India, USA, UK, UAE and other countries for her industries and academic related work. Prof Latha can be contacted in email: proflatha@gmail.com.